Whether you’re posting a single letter or sending out hundreds of packages a day – make life easier with Click & Drop. 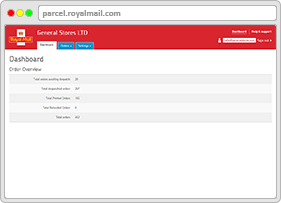 You can now print postage from your desktop in just a few quick clicks. Sending a one-off, or a handful of items? Simply enter a few details, choose a delivery option and print your postage in a couple of minutes. Regularly selling through online stores? 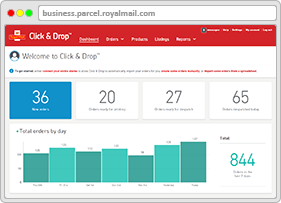 Pull all the orders from your online stores into your Click & Drop account and get your packages out of the door in no time. The price of your postage depends on the size and weight of the items you’re sending. See how you can send letters and parcels overseas. Some items, such as alcoholic beverages and batteries, are restricted in the mail. Some items, such as matches and pesticides, cannot be sent in the post. Click & Drop is compatible with the latest versions of Chrome, Internet Explorer, Firefox and Safari, and can be used on both Mac and PC.